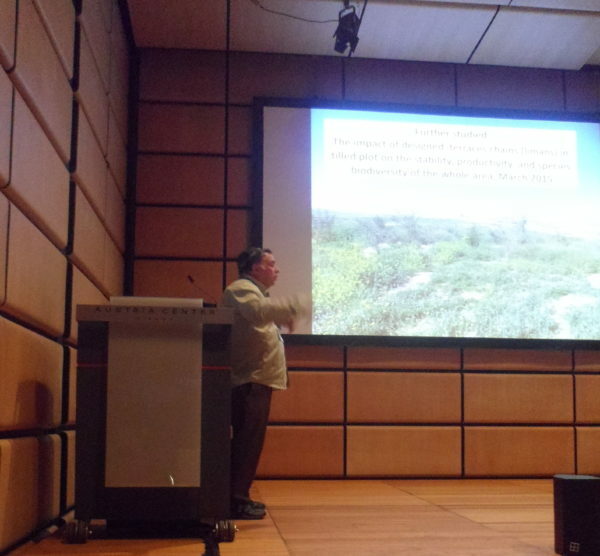 In late April, Dr. Stefan Leu, Director of our Ecosystem Restoration Initiative at PWA, and PhD candidate Amir Mor-Mussery presented their findings at the European Geosciences Union General Assembly in Vienna, Austria. Soil organic matter has increased by about 1 % compared to untreated control plots in most of the protected area, improving soil quality and amounting to a greenhouse gas sequestration equivalent to about 3-6 tons of CO2 per hectare and year. Key nutrient pools (NPK) show a gradual increase in the conserved plots, as compared to the degraded control plots. Conserved plots show better water infiltration into the soil as well as lower evaporation rates due to some soil cover. This leads to significantly increased soil moisture in the conserved plots compared to the degraded control plots. All three factors together contributed to significantly higher herbaceous biomass productivity in the restored areas. In Spring 2016, between 2.5 to 5 tons of herbaceous biomass per hectare (dry matter) were measured on the restored plots, compared to about 600 Kg per hectare in the unprotected areas. This indicates that one hectare of restored dryland can now feed 3-5 goats or sheep, while in the degraded, untreated control areas at least 2 hectares of land are required to feed a single sheep or goat! In addition, restoration was complemented by the planting of approximately 3,000 native or agroforestry trees that contribute to soil improvement, enhanced nutrient availability, food production, erosion control and biodiversity. The results indicate that soil conservation as well as sustainable land management and ecosystem restoration would enable sustainable agricultural exploitation of degraded drylands all over the globe, heralding significant gains in productivity, biodiversity and carbon sequestration. Applied to the 3 billion hectares of degraded drylands globally, similar approaches would contribute to mitigation of global warming, restore more resilient and diverse agro-ecosystems, and provide food, fodder and income to the inhabitants of marginal dryland areas worldwide. For more information please visit our Ecosystem Restoration Educational Website.